Imagine 500 people agreeing on anything. Now imagine that they come from all over California, from the remote Redwood Coast through the Central Valley down to San Diego. Different interests, different needs, vastly different experiences. But as the 2nd Annual California Economic Summit concluded in Los Angeles on November 8th, swift agreement was reached by all on what many called the big question of our time: how do we overcome the divide between the two Californias? It pervaded all discussions during the two-day session hosted by California Forward and the California Stewardship Network – a 10-member network that includes San Diego Regional EDC. “We are living in two very different worlds in the same state,” said Gavin Newsom, California’s Lieutenant Governor. He labeled it the "Gatsby Curve," demarking the more well-to-do coastal regions and those who continue to struggle in the inland valleys. The Summit briefing book provided the evidence, using census and labor statistics compiled by Collaborative Economics. While Orange County and Silicon Valley enjoy unemployment rates at 6.7 percent or less, the San Joaquin Valley’s jobless rate hovers at 12.7 percent and Imperial County’s is 26 percent, far exceeding the statewide average of 9.3 percent. One out of every 15 residents in the Central Valley have a Bachelor’s degree or better but here in San Diego the figure is one in two. Average wages in Silicon Valley are $98,079 per year yet the average for those living at the Redwood Coast is just $34,826. Those who assembled in Los Angeles knew that the answer that would unlock prosperity for all Californians won’t come from a person on a white horse, but up from the regions – regions rising together. They also knew that while a strong economy is critical to closing this gap, economic growth alone is not sufficient. Opportunity that extends to all Californians requires a focus on the triple bottom line: advancing economic growth, environmental quality, and social equity simultaneously. Summit-goers spoke intensely about education as the predicate for everything else we do. Of infrastructure to link us, careful rulemaking to guide us, capital to fuel us. 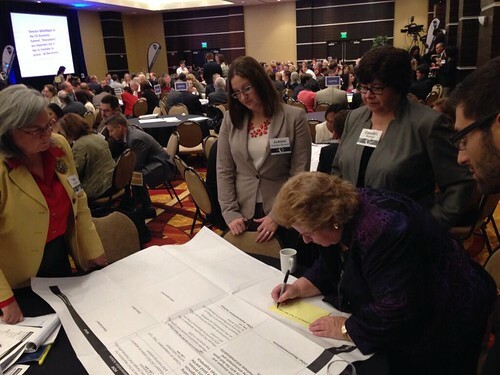 More than just talk, attendees from business, government, and nonprofit organizations signed on the dotted line, committing to specific actions they would take to improve things for the better. Hundreds of commitments were captured. This is as it should be. We need to have a statewide movement that connects and unites us all for a full recovery to take hold. This is what it will take to move the world's 8th largest economy.